The town of Kladruby (later called Staré [Old] Kladruby was probably founded in 11th century. Since 12th century the passing by Regensburg trade route passes by and enhances the importance of the town significantly. In 1115 Duke Vladislaus I founds a monastery and equips it with large properties from West Bohemia and other parts of the country. 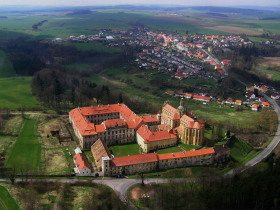 Kladruby Monastery often hosts various diplomatic negotiations. In 1219, for example, King Ottokar I of Bohemia, meets here with the papal court delegates. The extraordinary favours of the Czech kings, Ottokar I and Wenceslaus I especially, were enjoyed in large even by population of the monastery village Kladruby. Thanks to the king's favour, in 1233 the monastery finishes building of a roman basilica, Kladruby is granted the statute of a town and shortly afterwards a permission to hold annual fairs. Soon, Kladruby becomes a place where interests of the highest country officials start to clash. The situation and later the Hussite Wars finally lead to its power and economic decline. In the first half of 16th century the conditions slowly improved; the town acquires new privileges followed by a boom of all kinds of crafts. Even conflicts between the monastery and its subjects slowly come to a halt. In 1712-1726, the monastery church is being rebuilt by the significant baroque architect Jan Blažej Santini-Aichel in the so called Baroque-Gothic style. The building becomes the third largest church in Bohemia. In 1770, the new convent is finished and the prelature rebuilt most probably under Kilian Ignatz Diezenhofer's supervision. During the Enlightenment Era, Emperor Joseph II issues a decree abolishing the monastery. In 1825, Duke Alfred I Windisch-Grätz buys the entire property and rebuilds the new convent as a brewery. In 1843, Kladruby hits a devastating fire: only 46 out of 178 houses remain. After the fire, there is an outburst of building activity; the town obtains an entirely new look and its inhabitants new progressive beliefs. Various associations are founded, e.g. Tree-Breeding Club. At the same time, they built the cemetery church of St. Peter and finish construction of the St. Jacob Church tower. After WWI Kladruby have 1400 inhabitants of prevailingly German nationality. The monastery is largely called "a chateau" and belongs to Ludwig Aladar. In 1938, the Czech population is expelled to the inland. During WWII the town is overcrowded with mostly Silesian fugitives and the chateau becomes a seat of the Wehrmacht headquarters. The American troops enter Kladruby on May 6, 1945. 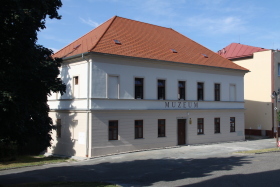 The policy of populating after WWII brings to Kladruby both Czech and foreign inhabitants from the inlands, while in 1946-1948 almost all German population is expelled abroad. In 1963 the town builds its much needed water piping, a new elementary school, nursery school, shopping centre, sewage disposal plant etc. In 2007, Kladruby gets back its statute of a town, lost after WWII.